This movie is probably the best Disney film I’ve ever seen, and since I’m an animated movie lover, I’ve seen a lot. The animation is amazing, the songs are wonderful (and stick in your head), and the story is heartwarming. I watched this movie with my grandkids Harley and Alecia. They both loved it. In fact, it’s the first time I’ve ever known Harley to sit still through a whole movie. That kid is full of enough energy for 10 kids, so he’s always moving and talking. But he was quiet, and his eyes were glued to the screen during the whole movie. I was amazed!! This is a movie that I think everyone would enjoy. Moms, dads, kids, grandparents…everyone! The animation was beautiful. The movie was funny, it has a few sad parts, and it showed how much love and loyalty family members can have toward each other. It also had some bad guys and a cute, hilarious snowman. And a snow monster. A BIG snow monster. 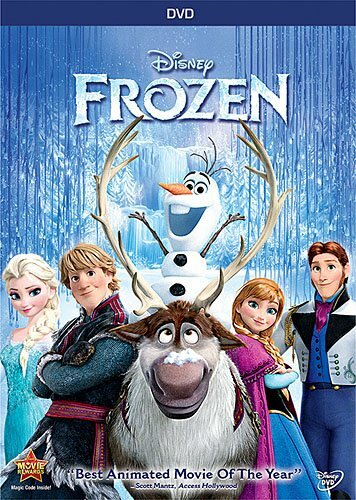 The only negative I saw in this movie was the way Elsa’s “special powers” affected most of her and Anna’s lives. I don’t want to say anymore about this in case you haven’t seen the movie, but if you do watch it, you’ll know what I’m talking about. If you haven’t seen this movie yet, buy a copy or rent it. I rented it but now want to buy a copy so we can watch it again and again. It’s that good!! 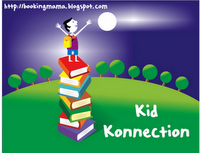 Kid Konnection is a regular weekend feature about anything related to children’s books. If you’d like to share a post related to children’s books(picture, middle grade, or young adult)from the past week, visit Booking Mama. Yes Frozen is definitely a “Stick in your Head” my grand nieces usually do a performance at family gatherings. Glad you enjoyed it. I’d love to see them do a performance from this movie! Maybe you could video them and share it on your blog. Wonderful review! I’ve seen this movie a few times. When I helped chaperone a key club trip recently, the students watched this movie a couple of times on the bus–it’s a favorite! Thanks! I’m sure we’ll be watching it a few more times too LOL! I’ve heard a lot about this movie but haven’t seen it yet. I’ll have to see if it’s on Netflix. I don’t know about Netflix since we don’t use them anymore, but I know Redbox has it. I hope you decide to watch it, I’d love to hear your thoughts about it. We watched this one as a family a few months ago and loved it! Such a beautiful movie with fantastic messages. I agree, it’s one of the best Disney’s movies. I love animation and sense of humor. Everything! I loved everything about it too.